Salary Survey - Get them in! Its conference time! 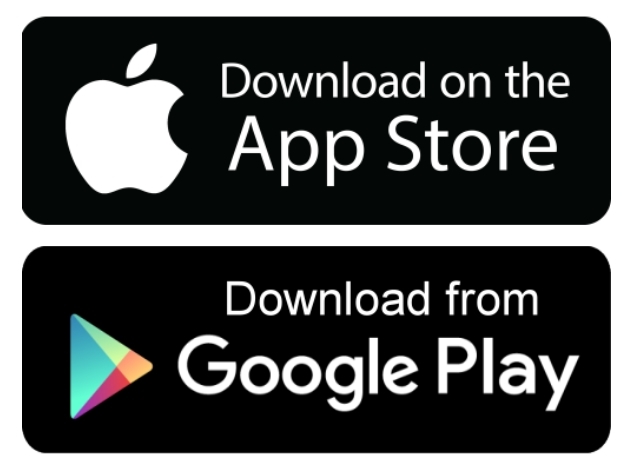 Before you head to San Diego, you can download our new conference app using Guidebook. We are very excited to host one of our largest conferences! With over 100 professional attendees plus students and guests we are topping out at almost 140 people. If you still want to try and squeeze in a session or two, please e-mail Kelly Cabal as a select number of single-day registrations are still available. Short course bonanza: The additional 2 days of short courses proved popular once again with most courses filling up and our CPT Interpretation workshop is now SOLD OUT! Check out the articles below for more short courses CalGeo is hosting this May - sign-up now as our small class sizes are designed for more instructor interaction and hands-on education, but they may SELL OUT. We are now collecting data for our 2018 salary survey. Please download the template and send e-mail the completed excel file to Kelly Cabal by May 1st! We plan to have the salary survey completed by early June so there will be very little wiggle room and extensions. Rest assured that your data will be kept confidential. Only members have access to the salary survey and if you don't participate it will cost you a cool $500. Save your money and submit the form! We have a new improved version with updated job categories this year. SAVE $500 and submit your data now! Please join us on Friday morning for breakfast and a half-day (7am-12pm) revised short course on LPILE software provided by Ensoft. We listened to your feedback after our 2018 full day course and have worked closely with Ensoft to revise the seminar to make it more hands-on, example based and really get you using the software. Space will be limited to allow for more hands-on instruction and Q&A so please register early. The speaker will also spend 30-mins introducing the new PYWALL v2019. Want to join? Contact Kelly Cabal for information on becoming a member! Thank you to Ensoft, our new Affiliate member for donating their time to prepare this specific course for CalGeo members after requests for a example and case-based seminar on the LPILE software. Ensoft provides one, two and three-day seminars in Austin Texas starting at $560/day if you are interested deepening your knowledge with their software program. LPILE is arguably the most advanced software for analyzing the response of any deep foundation element under lateral loads. The new LPILE v2019 introduces the concept of "Equivalent Elastoplastic Moment Curvature," a definition used by engineers and consultants in seismic areas (based in technical documentation from CALTRANS) to define the formation of plastic hinges in piles analyzed under extreme loading or for push-over analyses. The post-hinge behavior is clearly defined in the deflection curves for pushover models. LPILE v2019 also introduces the ability to open data files with complete soil layering and properties defined by the new EnCPT v2019 program. This separate program allows geotechnical consultants to offer to their clients new services for detailed interpretation of their CPT tests into various layering and soil properties that can be used quickly and customized in LPILE v2019 models. Finally, LPILE v2019 allows the optional input of a nonlinear moment-vs-rotation curve at the pile tip that can be used to account for the response of short or very large diameter piles. A new 3D View graphics is produced to more easily observe and present LPILE models and main results. We are bringing down Chris Kellen, the VP of Engineering at GEOSLOPE International for this 1/2 day short course and hands-on workshop on their popular software program, Slope-W. This half-day workshop will focus on slope stability analysis using SLOPE/W, with an emphasis on integrating pore-water pressures and stresses from SEEP/W and SIGMA/W, respectively. Topics will include an overview of the software user interface, a brief review of limit equilibrium theory and convergence, and the stability analysis of geotechnical structures in response to transient pore-water pressure changes. Other topics will include modeling reinforcement and an introduction to GeoStudio 3D (time permitting). Attendees will be provided with a 30-day activation license along with the necessary resources for hands-on exercises. GEOSLOPE normally offers workshops that follow a 2-day or 3-day format, covering SLOPE/W & SEEP/W + SIGMA/W (3-day), but as your time is valuable we are condensing the course and focusing just on Slope-W for this half-day course. Class will be limited to 60 attendees. Registration will include a hot breakfast, morning break and parking at the hotel. $150 CalGeo Members, $225 Non-members. Register by clicking the location links above. We are excited to announce that CalGeo's student chapter from CalState Fullerton placed 1st overall in the international competition at GeoCongress 2019! They had 4 students compete in the Geo-Prediction, 5 in Geo-Video and one student be a Geo Wall Judge. Thanks to CalGeo's support and sponsorship they were able to send 13 attendees to the event. 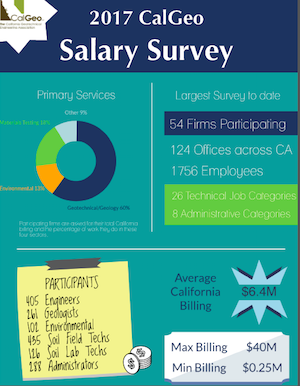 CalGeo made a point to sponsor ALL the California University GeoWall teams in this year's competition. 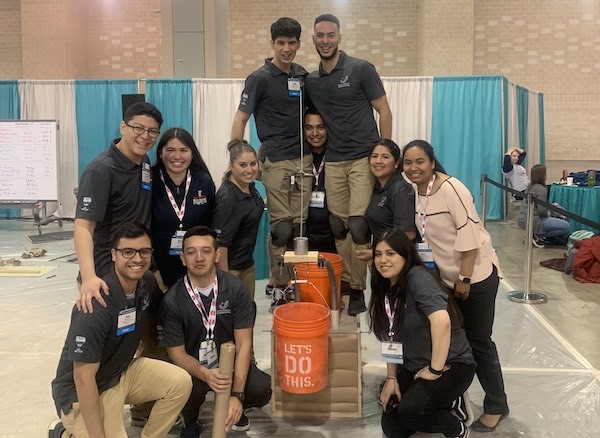 With CalGeo's help, students are able to learn leadership and team building skills while increasing their knowledge and exposure to geotechnical engineering. 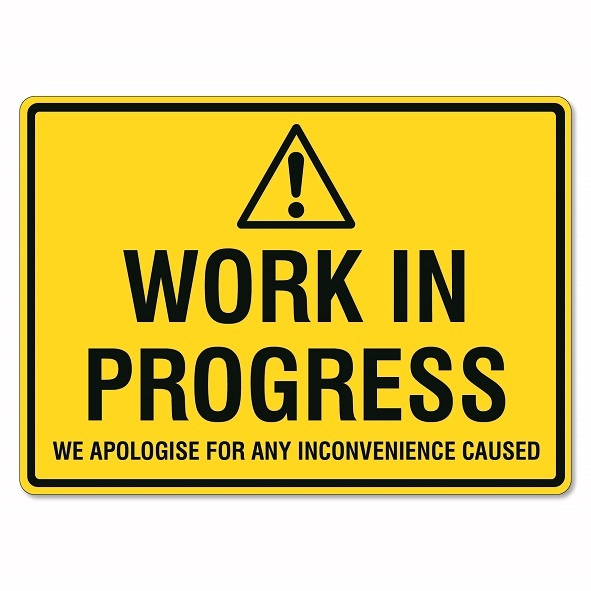 Thank you for your patience over the past year as we try and improve on our webcast and recording skills. Our different groups are getting the hang of GoToWebinar and we plan to continue webcasting our regional meetings and emerging professional meetings to those outside of the local area. We know its important to you to catch these topics and apologize for audio mis-haps. If you haven't been to our Members Club web page - now is the time to check it out! This is where you can find links to download PDFs of presentations as well as other related materials and view the recorded webcast if available. 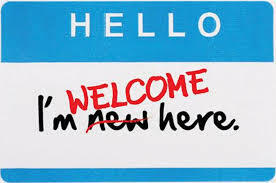 CalGeo's Member News section: where member firms can submit updates and press releases. Help out a local PhD. Candidate looking for data from slope creep instrumentation for his dissertation on Normal and Customary Slope Creep. Please e-mail Andre Hawks if you have any leads! 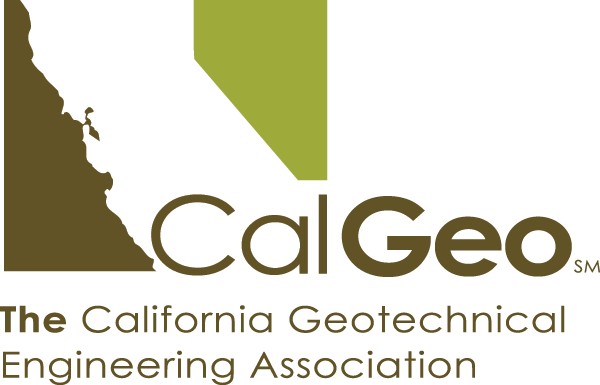 Andre will be at CalGeo's Annual Conference this April.